Wardee: My good and local friend Jami is guest posting today, sharing about the amazing new technique she found for seasoning cast iron. I use this method for all my cast iron now and it is fantastic! And, I demonstrate it in the March 2012 thank you video and I share three cooking tips in this free YouTube video. This method for cast iron seasoning creates a hard, non-stick surface. That's why I call it amazing! The article details all the science behind cast iron seasoning. The gist of it? The use of cold-pressed, unrefine, organic flax seed oil — complete with its low smoke point — is the best for achieving a hard, slick, lasting finish on cast iron. So that's what we're going to use! I followed the instructions for my previously always-sticking cast iron pans, and am thrilled with the results! Here's how I did it. The science of cooking with oil is the exact opposite of the science of seasoning with oil. When cooking, we don't want our oils to smoke because they then release carcinogenic free radicals. This is called the “smoke point”. See the bottom of this post for a chart of smoke points for different oils. When seasoning, we want to hit the smoke point. We want the oil to get so hot that a chemical reaction — polymerization — occurs, thus changing the oil into a sealant, of sorts. When flax seed oil changes into a sealant, we want it to be in the open pores of our cast iron pans. Never use flax seed oil when cooking with heat. It smokes at very low temperatures and releases free radicals into your food. However, this oil is wonderfully beneficial when consumed unheated in salad dressings, etc. Someone once suggested that I use oven cleaner to easily strip my cast iron pans of all their gunk. Unfortunately, oven cleaner contains harsh chemicals, so use this tip at your own discretion and with great caution. I went a different route that worked just as well for me. I set my cast iron pan on a burner and heated it — old oil, bits of burnt food, and all — for a few minutes on medium heat. Then I started scrubbing all that old gunk off with my steel kitchen pad, still over the heat. I scrubbed the bottom and inside walls of my pan, but if there's food stuck on the handle, bottom, or outside of yours, scrub those areas as well. Everything loosened and then came off. Next, I rinsed my warm pan under hot water and scrubbed it some more with a stiff kitchen brush. Then I put it back on the burner (with the heat off), wiped it dry and clean, and left it there to completely dry and cool. Success! My cast iron was transformed into a dry gray pan with absolutely zero seasoning on the inside. If your pan is newly purchased, follow the above instructions for cleaning off that factory pre-seasoning. It is soft and won't last long. Sometimes the manufacturer's seasoning is questionable — this is especially true of foreign pre-seasoned cast iron pans. It's best to start fresh from bare iron! It seems like everything involving cast iron also involves heat. This is no exception. Preheat your pan to 200 degrees Fahrenheit in your oven for 10 to 15 minutes, or when the pan looks dry and warm. This opens its pores and removes all moisture. Get flax seed oil out from the fridge and shake really well. Remove the pan from the oven and set on stove-top (FYI, mine is glass. Just be careful!). Squirt about a quarter-sized drop of oil (for a large skillet) in the pan, and rub into the pan using your hand or a utensil. Get every crack. The pan will be cooling off in the meantime, so if you use your fingers lightly, this will become more doable. Stop when the oil is completely, generously distributed and the pan looks shiny. Now, wipe off ALL the oil. Yes, all of it! The pan will look dull and like the flax seed oil is all gone, but believe me, it isn't. A very thin layer remains, and that's exactly what we want. Turn oven up to its highest temperature, or between 400 and 500 degrees Fahrenheit (mind goes to 450 degrees). When oven is preheated, place pan upside down inside for one hour. You shouldn't need any foil to catch the drippings — there'd better not be enough oil left to drip! 😉 The pan will smoke a lot during this time, so open windows or use fans as needed. This is caused, not by the oil, but by old gunk still stuck to the bottom of the pan. At the end of an hour, turn oven off and allow pan to cool inside, with the door closed, for about another hour. When cool, the pan will look a little darker, but still matte in appearance. You're aiming for a semi-gloss. In fact, it needs at least six coats! Repeat the above steps five more times. The smoking shouldn't be as bad for the rest of the coats. It's caused by some of the old stuff at the bottom of the pan wearing away. Here's a video from #AskWardee — How To Season Cast Iron The *BEST WAY* & How/When To Re-Season It! For best results, clean cast iron pans while still warm, just after using. Most of the time I clean my pans by wiping them out with paper towels. When I cook sticky sauces, I run hot water over the pan and scrub it with a non-stick pad or brush simultaneously. Then I place the pan back on the still-warm burner and wipe it dry with a paper towel. I look for a semi-shiny finish without any dull spots. If there are dull areas on the bottom of your pan, remove by scrubbing pan while still warm, on a burner with a steel kitchen scrub pad and some oil. The dull areas are actually very small amounts of cooked-on food or oil. Scrub until steel pad slides smoothly over the surface. Wipe out with paper towels and allow to cool. The finish should now be semi-glossy and smooth again. Here is the nice semi-glossy finish on my pan. This is such a straight-forward, easy method. I hope you give it a try and enjoy the same success! Give it a try and let us know how you like this method! Jami is a self-employed, single mom of two teenage children. With 35 years in computer technology, she runs a small programming business from her home. Jami and her children are passionate about their small urban homestead, complete with farm animals, gardening and permaculture values. Her family and friends are at the center of all she does. Thank you, Jami and Wardee for some much-needed instructions. I think I’d better wait until it’s a little bit warmer out and I can open the windows. Then, I’ll take on our cast iron pan that just started sticking. Great to know that flax seed oil is the one to use. .-= Ellen´s last blog post… Cooking with Sprouted Wheat: Pumpkin Raisin Muffins =-. Thank you! I had been wondering why my cast iron wasn’t maintaining its good seasoning. I was using butter, bacon grease, olive oil, and seemed to have to reseason every couple of weeks, and still had times that cooking anything liquidy (even just adding water to reheat something) would totally go through the seasoning. I’ll be buying some flax seed oil! I’m excited to try the flax seed oil-it would be awesome to be able to use my pan again! I do have a cast iron grill grate that I love (and actually bought pretty recently), but it ALREADY sticks quite a bit, especially the grill side, so I’m a little frustrated about the fact that it hasn’t seemed to “last” so long, so probably I’ll be trying this method with that one as well. Thanks!! I’ve had a pan that needs re-seasoning for a while and I’ve totally been avoiding it! This info is just what I needed–I actually feel inspired to do it now : ) I’ll even post some pics of the process so everyone can see the “during” part. Thank you! Great tutorial, thanks! I have a few pans I’d like to re-season; including a flat grill. Since it takes 6(!) cycles, could these pans be done at the same time, or would it be too hard to adjust the temperature/timing to accommodate this? Sure they can, not a problem. The process is actually very flexible, so no worries if a pan gets hotting or stays in the oven longer. Thank you so much Jami for sharing this! While it does sound labor-intensive and time consuming, if the end result is a truely non-stick pan, it will be worth it. I can’t imagine not putting a layer of oil in it every time I use my pan to try and re-season it. I can’t seem to make scrambled eggs without them sticking. Does this work for even scrambled eggs? Also, how do you know when flax oil has gone bad? I have some in my fridge, and I didn’t know you were supposed to shake it, and it looks a little brown and I don’t know if that is normal or if I should throw it away. It was pale yellow when I first started to use it. I’ll let you know when I try this how it goes, I will be so happy if it works! How to cook using cast iron is a whole other article, there are tips for success and methods for cleaning that are not covered here. That being said, yes it does work (in it’s way) for scrambled eggs. Cooking: It helps if you add water to your whipped eggs, thinning the sticky yolk (do not use milk). And if you don’t over cook the eggs. Adding ‘extra’ fats, especially veggie fats, will not help with the cooking or cleaning. Thinking one needs more lubrication is a common mistake. Cleaning: Some egg will stick, mostly on the sides and grove of a pan where you cannot scrape completely while cooking. After removing the eggs, take your metal scrub pad (no soap or water) and knock the bits of egg loose from the pan; then wipe them off into the trash with a paper towel – done! Smell it, it will smell bad, strong or fishy. Normally fax oil has a mild smell to it. As for color, this can very for many other reasons so it is not a sound indicator of rancidity. Per the chart on smoke points, I’m wondering if you think the safflower or sunflower oils would work as well. Their smoke points are the same. Has anyone tried either of these oils? All these oils are in the low range for smoke point – 225 F – the Unrefined is the key to their low smoke points – the smoke points are much higher for refined oils. I have not tested any out except flax seed oil, and I am not an expert on cooking oils. I do know that vegetable oils stick or bond in a way that animal fat/oils do not. This is important for seasoning 🙂 And we all know about the reason for wanting a low-smoke point now – to change the oil into a sealant of sorts. So I would have no problem giving one of these unrefined, organic, low smoke point oils a try. Unrefined oil: Unrefined oils are usually cold-pressed, which means the oils are mechanically extracted by a machine which applies pressure and not heat. This leaves the high flavor and nutrient content in the oils, making them a healthier choice. You may have seen “Cold Pressed Coconut Oil” at the store. This means it is an unrefined oil. Refined Oil: Refined oils are extracted using heat and a solvent, which are then bleached and deodorized. This processing also changes the smoke point. By the way… this is an outstanding article! Like others, I have been frustrated that despite my best efforts, the seasoning on my pans does not ‘stick’. I can’t wait to try this method!! Christina – If you click over to Sheryl’s blog you’ll see an additional discussion of why flax seed oil is better than the others with similar smoke points. Here are two key sentences. Ma’am, I am new to cast iron cookware. Having had no experience in the past, I wanted to know if seasoning with cold-pressed flaxseed oil is for only newly bought pans after you’re done with deglazing the factory seasoning, or it can be used on a routine basis as well. Meaning, using it after every cooking session. If not, then what oil should be used for day to day seasoning when one is using the cast iron everyday or almost everyday. I use Avocado and Coconut oils to cook with. I would only use flax seed oil for seasoning (high temps, smoke off) or on a cold salad. What great information!!! I have 3 cast iron pieces that I use often, but would use a great deal more if they were coated as yours is. I am inspired. I’m going to start with my 2 burner skillet tomorrow. Thank you for a GREAT and very practical post!!!! Thanks to both of you! I really needed this post. I have some flax seed oil in the frig right now and my cast iron pan is dying for a good seasoning. I think I’ve been doing it wrong all this time. No wonder… !! .-= Melissa @Cellulite Investigation´s last blog post… Cellulite Secrets, Declassified (Codename: StrideRight) =-. Thanks for really great instructions. I have a couple of skillets I need to do. I’ve been putting coconut oil on them, but I guess that’s not right. I have a really dumb question though. I know we’re not supposed to cook with flax oil, so why is it OK to put it on these pans and then cook with them? Sorry if it’s really obvious. Thanks. I am wondering this also. Do the negative properties of rancid/heated flax oil go away after the pan is seasoned, thus not contaminating food every time the pan is used? IOW, once the oil seals the pan, are there any residual negative effects? It seems odd that you can safely use a pan that has been seasoned with something we shouldn’t consume after it’s been heated. I hope this helps answer your question…. Thanks for the information. My husband is always telling me to season my pans. I have quite of few cast iron pans from my grandmother, well, I will be pulling those out real soon. I almost missed this post. Caught in on the Week In Review. What great information. Thanks Jami and Wardee. I have 6 cast iron pieces I am going to treat with this process. (Including an aebleskiver pan I bought at Goodwill a few months ago! Wardee – we are definitely kindred second-hand shoppers!) I also bought an American Harvest 8 tray dehydrator for $5 yesterday at a yard sale!!!!! (I have a dehydrator an Aunt gave me that’s shaped like a microwave and the size of Rhode Island – it’s going to a new home). A naturopath of mine strictly warned me to NEVER heat flax seed oil because it could be harmful to consume. Here is some information that might be helpful. Spectrum Naturals also produces cold pressed organic flax oil, the most potent source of omega-3 essential fatty acids of all oils. Flax oil is best suited for salads, dressings, dips, spreads or already cooked meals. Heating flax oil with temperatures above 210ºF will cause molecular changes in the oil making it harmful for the body. Flax oil is very unstable and should be kept refrigerated. Typically, unrefined oils may be used for low to medium heat cooking as they can only withstand temperatures of 250 to 350ºF, depending on the specific type of oil and manufacturer. Rapuzel makes organic oils using true cold pressed methods. Here are the smoke points and suggested uses for some of their oils as suggested on their web site. Just thought I would give a second view. I am not sure if the flax seed oil that has been cured onto the pan would be harmful or not. Thanks for this info. I have not tried flax seed oil on my cast iron, but will do it this way now. When I have a piece of cast iron that is really gunky, I put it in my oven when I turn on the self cleaning. Really cleans the pans nicely. Christie – I like my 8″ skillets. They fit perfectly on the large burner of my electric stove. Sometimes they are a bit small though – a 10″ would be really nice, but overly large on my stove. When buying, look for unseasoned, if there is such a thing. You what, I’m going to ask Dani her opinion – she’s been commenting here lately. She is setting up a cast iron online shop and she also knows a ton about this, so I’d like to get her opinion on brands and such. I noticed you use your iron skillet on a glass top stove I was told I could not use mine on my glass top.. Do you have a special glass top? I would love to use my iron skillet all the time. You just need to be careful with glass stovetops. I think people recommend against using cast iron on them because they are heavy and can either scratch the glass or if dropped, break it. I’ve used cast iron on mine for years and never had a problem. It’s been a long time since the original post, but I’ve had a glass cooktop for over 15 years. I’ve never treated it any differently than any other cooktop even for high heat or candy cooking and have never had an issue. Just my two cents! Lanise – I had the same question. And I’m not totally settled, but I think it is because no matter what fat you use, it needs to get beyond the smoke point and chemically change into a seasoning. So it is not “smoked.” The same thing that makes flax seed oil so good (high amounts of ALA) is what used to be so good in lard 100 years ago when pigs were raised better. See Cheryl’s article for more details on this. Laura – I know this is hard to believe. I’m not sure I 100% believe it myself. But I’m coming around because this technique doesn’t ask us to “smoke” an oil – it asks for such high heat that it changes into a polymer – and this would happen with whatever oil we use. The flax seed oil makes it not gummy, though. I spoke with my IT guru (yes, that is Dear Hubby) regarding our website, and he is still adding items and prettying up the site, but it is working. Regarding the best “brand” for cast iron, in our research, we have found that many times, you will get what you pay for–we had some really cheap, made-in-China fajita pans that we ended up never using because, brand new, the surface was so pitted that no amoung of seasoning would have helped. So, whether you buy from us, or from anywhere else, we do suggest buying a name-brand as opposed to some special in a catalog. On that note, hubby has made an effort to list as many brands as possible on our site, since he wants to be the one place that people can go for whatever brand they’re searching. You’ll see all different brands on the site, including some enameled cast iron, which is considerably more expensive, and a moot subject for this blog post! However, none of what we have listed is the poor-quality stuff that you get at the Dollar Store. Without further ado, the website is simply http://www.castironcollection.com and we welcome any feedback, as the site is still under construction. Our recommendation based on what we have listed on the site (again, whether you buy from us or from somewhere else): buy what you like and can afford. I have one piece of enamel (a stockpot), and everything else I cook with is strictly cast-iron. One thing to keep in mind if you haven’t cooked much with cast iron is that the skillets will likely be much heavier than the pans you cook with now; my wrists are in an intensive training regimen to be able to hold the pan while I scrape sauces onto entrees! 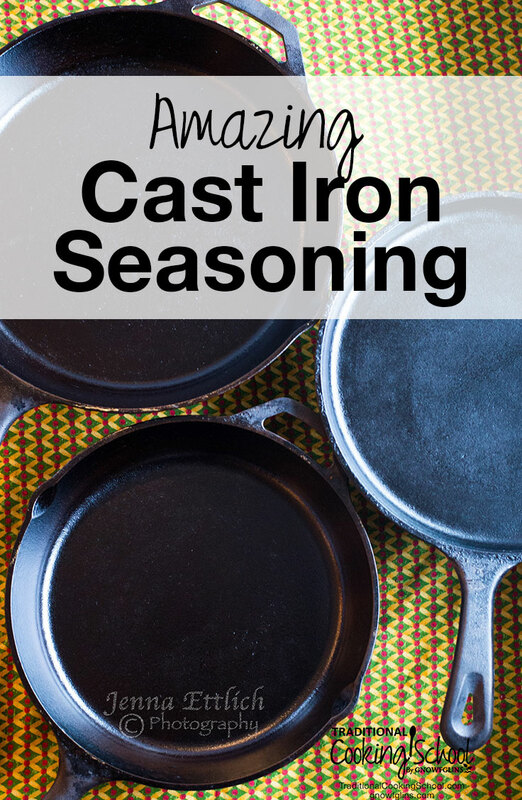 Thanks goes out to Jami and Wardee for this great post on seasoning cast iron! Is there an updated web address? This one goes to an apartment complex in Jersey. I must remember to wipe them out instead of washing them or rinsing them and they will keep on doing thier thing! Thanks Jami and Wardee for these great tips on seasoning/re-seasoning cast iron skillets. I bought quite a few a number of years ago, and due to their stick-ablilty, I don’t use them much. When the weather warms up (snow on the ground today!!!!) I will be re-seasoning them! I have heard that Spring is, in fact , coming, and after last week (60 degrees and sunny), I thought that rumor might be true, but we’re back to making snowmen today! Oh well……. I want to update everyone on my pans. I completely re-seasoned two so far. It is a long process because I don’t have that much time. I would love to have a self-clean cycle on the oven, but I don’t. So between elbow grease and oven cleaner, my pans are mostly still in process. But, I have finished an 8″ skillet and an ableskiver pan. I have been using the skillet almost exclusively for everything the last two weeks – frying eggs, warming up rice, hash browns, pan fried salmon, and more… The seasoning is amazing! So amazing. Nothing sticks like it used to. Foods get crispy and come right up with a spatula. It cleans easily and the finish is smooth, not gummy or cruddy. I scrape, rinse, and dry. Hardly any care at all. I applied the seasoning to the 8″ skillet about 9 times. I could tell after 6 that it needed more because there were two parts that were slower to be seasoned. So I kept applying coats until those were seasoned well. I have not hardly had a smoking problem at all, either. The kitchen smells, but nothing smokes. Still to go: 2 waffle irons, another 8″ skillet (really a toughy! ), and a cornbread pan. Ellen – Don’t wait! All this heating is more welcomed at this time of the year. I opened up my small kitchen window just for the first session and didn’t change the house temp at all. Winter, Fall and Spring = best times to re-season. YES 🙂 Not a problem, just heat, oil and bake ’em all at the same time. You know it really isn’t, because you don’t have to be fussy about the time, bake it over an hour if you can’t get to it. Taking it out and applying the oil, then wiping off takes well under a minute. I ran 3 sessions the first day, and 3 the next when I got around to it – no big deal at all. Did my 3 pans at the same time – done! This brings up another point I wish I had covered in the article. The difference between oils, in this case vegetable and animal oils. Seems vegetable oils (especially coconut) can gunk up over time and re-heatings. And this tacky residue (old oil) can actually help to remove a soft-seasoning (this is what I did wrong that broke down the seasoning in my cast iron I believe). This doesn’t seem to be the same issue when leaving animal lard in a cast iron, but I haven’t yet run a side by side test. I have left a very light coat of peanut oil in my pan and didn’t noticed the tacky when using it later as I did with the coconut oil, but I am very careful now. I lean hard towards leaving a ‘dry’ sealed pan when I’m done using it now days. Since the pan is hard-seasoned we don’t have to grease-it-up all the time like before when it was prone to sticking. Yes, I have made egg foo young 3 times in my pan since seasoning it. And while the egg may attach in a few places on the sides and seam it comes off easily with a pass of the spatula. I would not try using old flax-seed oil – just get a fresh bottle. If you have a pan with a good seasoning – flax oil or some other, that is becoming tacky, try just running it through the burning cycle (1 hour at high temp). This will burn off old oil film and get you back to your seasoned pan. If you feel your seasoning has been compromised and/or removed – then start from the cleaning step. Follow this advise even after you re-season your pan with FSO, to keep from building up a tacky later. Laura – The high heat, for at least an hour+, chemically changes the make up of the oil completely. It is now chemically a new substance, a hard ‘thin’ sealant, that will no longer off-gas, or break off easily. As for me – I would worry more about (1) other seasonings that are ‘soft’, which can come off into food more easily, and/or (2) cooking with other added oils at their smoking point or (3) even not wiping out the pan(s) after their use leaving oils to go rancid, tacky or attract dust contaminants. I really feel this seasoning, when done correctly, is very safe and forms a better bond with the cast iron. Wardee & Dani – gave good advice on sizes, unseasoned pans and brands. I would add that cast iron made in china, Twain, etc. come with a very bad chemical seasoning on them. Strip these pans and start fresh! American made – pre-seasoned cast iron has a safer seasoning, but it is soft, and can disappear quickly depending on how well you care for your pans. If you are worried about chemicals then always strip and start over 🙂 This way you know what’s on your pans. My cast iron skillet is 12″, it fits my large burner nicely, and is a nice size for large and small needs. Wardee, maybe you allow me to edit the article and add this additional information one day 🙂 You also reminded me I have to dig out my cast iron waffle iron and season that sticky bugar too! Jami – Feel free! Send me whatever edits you’d like and we’ll update the article. Thanks for your kind attention to all these questions. You’re a wonderful resource! And I’m so enjoying my pans! So, when you cook eggs what kind of oil do you use? I used to make omelets but I have not been able to make one in the cast iron pan because of the sticking issue. Have you tried to re-seasoned your pan? How about a good cleaning in the oven? Fixing your sticky issue would be the best way to go, but if you can’t just now then maybe you can find an organic peanut oil – this oil is very slippery. It might help your sticking food. No need for oven cleaner – throw the iron in the oven next time you run the self-cleaning cycle, if you have one. I’d want the opinion of someone who was both a chemist & naturally-minded (understands the issues with overheated polyunsaturated fats) before doing this. Our pans are beautifully nonstick, including the pan we use daily for eggs – they literally slide around the pan! We season it the traditional way with lard from pastured pigs (glad to see in the comments section that that is what this flaxseed oil method is trying to replicate!) – about an hour in the oven, just once. Then the first month we use it, we heat it for just 10 seconds after cooking, put a bit of lard or unrefined coconut oil in it, turn heat off and wipe oil in with a paper towel. After that, we just cook with normal amounts of fats and of course, never use soap, steel wool, etc., and it rarely takes more than 10 seconds to clean it after cooking. thanks for your reply on lard — I have some fat from a pastured pig that I am planning on rendering. Also wondering if that would work instead of the flax oil. Since I have very old pans that are ‘machine finished’ from my Grandma, I am very hesitant on putting any steel wool on these pans — steel is harder than iron is it not? These pans have a glass like finish, but still have a problem with foods sticking. Also have heard not to use anything with tomatoes. ?? HI did anyone ever reply to my question about using steel wool or copper pad on old pans for cleaning? I would think that Steal wool would be a expensive option, because it will gum up and stop being usable very fast. The cheap copper pads from the dollar store are what I use. I found I just like them better than the more expensive brands. I rinse these pads under hot water while whacking them against the side of my stainless steal sink – (I don’t think I would try this if my sink were made of some other white material). This easily removes the gunk. I then sit them in a dish to dry as they will leave rust stains where they sit. Other people use salt and a plastic scrub pad, however I like to clean while the pan is still very warm and so I go with metal pad, oil and paper towels to wipe off. I hope this gives you some ideas to try. Hey Jami…..great info. I don’t think I’ve ever seen this explained better in the 30 years I’ve been cooking in cast iron. Thank you. I was wondering where you got all of your data on smoke points? Not that I doubt anything, but when I pass info along, I like to be able to verify the reference. I’m teaching a class at Lehmans Hardware on dutch oven cooking over Memorial Day weekend and would love to share this at the class. Thanks again !! science book somewhere, but I’m sure they quoted their source. to…… I should have my update done by this weekend. I must have done something wrong. I followed the directions exactly and did it 6 times. I cooked an egg in the pan this morning and it stuck just like it always did. What did I do wrong? The pan is definitely shiny but not non-stick. Also, I had a problem with rubbing the oil into the pan with my fingers as the pan was very hot after just coming out of the 200 degree oven. I used a paper towel to help rub it in because the pan was just too hot for my fingertips. Maybe that’s what I did wrong? Another question for Melinda, if she did all the seasoning right (and it was enough! ): Did you heat up the pan before you added the eggs? I never have problems with eggs sticking in my pan (and I haven’t done the FSO method yet, but I have everything stacked up, ready to scrub) as long as I heat it up first. It took me a while to learn that trick, though! Try it. The pans are hot, sometimes waiting just a minute will make the difference. I’m not sure if using a paper towel would do anything, but it may not lay down enough oil in the beginning, so this next time only use them to remove the oil. Here’s what I suggest – put your pan in the hot oven at high temp for 30 min. just to take off anything not sealed as of yet. Then let it cool down in the oven as I direct, but take it out while it is still real hot (200F) and use a wooden spoon or anything non-absorbent to help spread the oil this time. Don’t worry about the time it takes you as the oil needs to sit on the pan just a bit before you wipe it off with your PT. Then continue with the directions, wiping off the oil and heating your pan at high temp for one hour and cooling in the oven for one hour more. For cooking eggs use oil, but just before you put in your eggs lay down some course salt and put the eggs on it. This too helps the eggs once cooked to slide on the pan. And consider using a nice organic peanut oil just for frying your eggs – this oil is very slick and can help when cooking certain foods. Eggs can be hard, especially scrambled eggs – however try my suggestions, I’m sure you will see better results. Don’t give up . . . . Thank you Wardee and Jami. I do cook my eggs in coconut oil and sometimes a small mixture of butter and coconut oil. I learned from the Food Network channel a long time ago that eggs are best cooked “low and slow” and that is how I always cook my eggs. I was so excited to try the seasoning of the cast iron and I just tried it yesterday and followed the instructions exactly. Today, I made a skillet meal in my cast iron skillet and after washing the skillet, the pan looks on the bottom like all of the seasoning came off. I don’t know why it did that. I followed the instructions completely. I baked the pans at 450 degrees and I got brand new organic refrigerated flax seed oil and it still did this. Does anyone know why it did that? I thought it would be good to tell you what kind of flax seed oil I used. I used Barlean’s highest lignan content 100 % organic, pure & filtered, and cold pressed fresh daily(America’s best selling omega-3). I also did the process 6 times, just like it said a minimum of 6 times. I am very disappointed. It took a lot of time. Please help me figure out what went wrong. Thank you…. Claudine, I think that high-lignan flax seed oil contains more fiber particles than regular flax seed oil — did you notice that the oil was quite cloudy? If that’s the case, they may have interfered with your seasoning! I would try it again, straining out as many of the particles as you can so they don’t stick to the pan when you’re rubbing in the oil. Claudine – I’m so sorry to hear your having a hard time with your pan. First, how your pan looked before you started, was all old seasoning really gone? After each session how did your pan look? Did you see the finish changing? How did it do as far as the smoking during each session? And did you let your cooking oil cool down before you started cleaning your pan after your first use? Cooled cooking oil can be gunky and be bad for a slick finish. It appeared to me that all the old seasoning was gone. I used a wire brush to clean it and there wasn’t any caked on things. It actually looked very good before I started. I did see the finish changing after each session, especially after the 2nd session. It started to get darker. The pan was really, really warm when I applied the oil before wiping. I even used a wooden spatula to move the oil around and up the sides of the skillet, since it was too hot to use my hands (just like I read in an earlier post). I really didn’t have any smoking during each session. I was surprised because I didn’t notice any. I used olive oil for cooking in my pan for the 1st use and made a GNOWFGLINS skillet dish and it didn’t still have oil in it when I went to clean it. Did I do anything wrong? Thank you for your help. No, Claudine you didn’t do anything wrong. Try something for me and report your results – warm your pan on the stove, add a drop of oil and use a non-melting scrubber to oil-scrub the inside of the pan real good. Now when you are sure the surface is clean and smooth wipe it out with PT until the now dirty oil is gone. Sometimes things we cook will leave a residue, this dulls the finish and looks like you’ve lost it altogether, but it’s just the residue covering your finish. Cleaning with the warm oil takes it off leaving your seasoned pan ready for it’s next job. One other thing I’ve learned as I use my pans is that animal fat (lard) is much better at not getting tacky or leaving a sticky film than the veggie/seed oils. So when cooking eggs now I use butter/beef lard or butter/coconut oil and not straight coconut oil. This seems to help with the ‘sticky’ a lot. Let me know how your pan turns out Claudine. I know it’s been a while since this posted, but I just wanted to let you know how fabulously it worked on my cast iron pan! I think it only took maybe 4 coats before the pan wouldn’t even take more. I am just now adding another couple coats months later and attempting to salvage a cornstick pan with the same method. I think the multiple fine layers make such a difference; my pan is so shiny it looks like you could skate on it! Beautiful color. Great to hear about your experience 🙂 thanks for posting. I am finding better and better results myself when using animal fat (rendered beef lard, or real butter) in my pans that have the new hard seasoning on them. If I do use a vegetable oil I cut it with the animal lard half and half – this is really helping with the gunk heated vegetable oil can cause in some instances. Even after my daughter has not followed procedure and really stuck things to the pan, I can warm it, use oil and scrub it clean. Then the next time I use it I only use animal fat and everything comes right great. If anyone is still having sticky problems after re-seasoning with the flax-seed oil I recommend experimenting with the oils you use when cooking. This can make a big difference in your pan performance. All the best HB with your newly seasoned pan! I just watched the sourdough e-course where Erin made sourdough crepes. I was amazed that her crepes didn’t stick at all to her cast iron skillet!! Just wondering if we could find out how she seasons her pans? I would love to make crepes in my skillet! Christa — I use the seasoning in this post, and my crepes don’t stick at all. Just like Erin’s. I’m not sure what she uses — but I’ll ask her to let you know! How shiny do these pans get? I want to do it right and not quit too soon but I have done 7 layers of flax at this point. My pans seem evenly semi-shiny. They look like they looked when I bought them (well the preseasoned ones.) I’m esp concerned about my muffin pans. They look shinier in the crease than the flat of the bottom but that also doesn’t appear to change from one layer to the next. I made muffins with the factory finish on them and they stuck horribly so I don’t want to do that again. Anyone know what the black flakes are after seasoning? Should I clean it off? Is it safe to consume? Sonia – I would dust them off and not consume. Sounds like something wasn’t complete burned off in the seasoning. thank you so much for you expertise on this subject. I have a question. I need to go gluten free and need to get rid of anything that has remnants of gluten on it. I don’t want to part with my iron skillet if I don’t have to. Celiac posts claim that the skillet has “pores” that hold the gluten particles, thus making the pan almost impossible to de-gluten – although one method is a self clean oven cycle which supposedly might be able to burn out the gluten particles and allow for a re-season. My husband was going to use his electric drill with a steel head attachment and just try to remove everything to it’s bare state but I am not sure if that is enough. After studying these skillets as you have, do you think this would take care of my concerns? Of course, then re-seasoning it? I think either the (1) oven cleaning cycle, or (2) oven temp of 500F for 1 hour, or (3) your husbands sand it off plan will work just fine. I bet a few hours soak in ACV apple cider vinegar would do the trick too. Of course in each case you’ll have to re-season, in options #3 & #4 you’ll want to clean off sanding bits or rust before re-seasoning. There may be microscopic bits of gluten in the pans pours, but they cannot reproduce – so use over time will also eliminate them as a factor. The other methods listed above are just faster options. Also as Wardee and I have found – once we started soaking and fermenting, our gluten intolerant family members can now tolerate occasional gluten exposure. For my very reactive son I give him a big glass of kefir to drink when having things like birthday cake at friends parties – works like a charm now that we soak/ferment regularly his body can better regulate its self. My doctor is watching my antibodies against the gluten so that will be a good marker once I go gluten free as to how I am doing with gluten in the future. For now, I will avoid it and then once I get a test result without antibodies, I will be able to try some traditionally prepared wheat/grain and see if there is an antibody response. It should be a very good test IF I can see the day I have no antibodies in my tests! Loved the post and thanks again! I used this technique on a wok that I used. I’m on the 3rd coat right now and so far it looks very good. A nice even black coating is covering everything. I burned off the old coating using my ovens low setting cleaning cycle. I find that “low and slow” does not work at all for cooking eggs in cast iron and butter is the BEST fat, then lard/bacon drippings. When I cook eggs (in my one good pan, the others have yet to be re-seasoned : / ) I heat the pan until it is hot enough that when I apply some butter it sizzles (NOT smokes) initially, then settles. When I drop my eggs into the pan they also make a sizzling/frying sound. If you add enough butter the eggs seem to float around and you have to be careful that they do not fly off your flipper, they are so slippery!! I read Sheryl’s blog on the subject and doesn’t she say NOT to smoke the oil?? She says that there should be no need to open the windows and that by first heating the (bacon fat) below smoking point she is then able to heat it above that temp without causing smoking as it has apparently been changed by the initial heating. She also started with avocado oil (6 times), so I am a bit confused now. Regarding Sheryl’s blog: I believe you are confusing her initial tests/experiments, cooking verses seasoning, her smoke point remarks and my experiences detailed here. It probably would be best to post specific questions about things shes says, on her blog. I mentioned opening windows (when first seasoning an old pan) because there will be ‘other stuff’ that will burn off at that high temp. This is my experience. I haven’t had to re-season any of my flaxseed-seasoned pans, but I imagine the smoking will be very minor the second time around. I hope this helps clear things up a bit. Let me know if you have any other questions about my method posted here…. 🙁 just finished re-seasoning my cast iron with this method 2 weeks ago. Awesome! But then…my mom came to visit and while I was at work today, she made grilled cheese and…yes, washed my newly seasoned pan with soap and water :…( So now what…do I need to completely re-season through the whole process again, or just heat and rub? Or maybe only a few rounds instead of 6? What do you think it needs? I’d say just heat on the stove top, add some animal fat – lard, butter, whatever and rub it in good with a paper towel. Then see how it works . . . . I would think the polymerized oil in the pores would still be good, but if not (Mom could have a mean scrubbing arm) one re-season should get it back. Keep us updating on how it turns out. Hi Jami – this is brilliant – thanks for posting! Just a question – do you oil the pan again after washing in water? Normally this is the standard advice for maintenance of cast iron pans. Or is the seasoning so tough it doesn’t need oiling after washing? I’m in Australia and cast iron isn’t big here – except for Le Creuset etc. I bought a few Lodge cast iron pans through ebay, and am just loving them. However I have found that the seasoning is quite soft, and I have redone it in the oven with coconut oil, and also with lard. So I’m very keen to strip them back and re-do with flax oil. I’m also really jealous of all you in the US who can find antique cast iron in thrift shops. They are very rare here, and the shipping cost is a killer. I have cleaned my pans in a lye bath, followed these instructions, using a micro fibre cloth to get the thinnest possible coat. I set my oven to 500 degrees (the highest it goes). What I am worried about it is – even though it does stink quite strongly – there is no visible smoke. I am assuming that raising the temperature past the smoke point means I’m fine regardless of seeing smoke, but I’m concerned that because I’m not seeing any smoke, the fininsh may not be polymerizing. Perhaps my pans are very clean and the very thin coating of oil prevent the smoke? I just want to make sure my pans are safe to cook in after. I have one pan that has been through the cycle 4 times – I have two more times to go to see if I achieve the proper results. Can you put my mind at ease? I am using organic unrefined flax oil. Like you say it could be that your pans are very clean and the oil is so thin that you not seeing smoke. If your concerned don’t use the micro fiber cloth on the last two coats 🙂 just to make sure the pores are completely covered. Thanks for your suggestion. I did actually leave a thicker coat on one pan with a paper towel that splotched up the finish – but alas, no smoke again! Its in the lye bath for a do-over. I think I will just follow your advice to ensure complete coverage but still thin enough, and I’m going to get an oven thermometer to ensure my oven is indeed at the temperatue the dial says. If the temperature is past the smoke point – I suppose it must be working. I have even tried two different brands of flax oil, on two different pans in one run through. As requested I will let you know how it all turns out. Did you see much smoke when you did your pans? I wouldn’t lye bath it again, I don’t think there is anything you really need to strip. Some people’s do blotch a bit, however with time and use the finish will smooth out. A good high temp bake is the best thing. Why don’t you heat it on your stove top and scrub it with a metal scour pad (not SOS, just plain copper or steal pad) plus a bit of butter or other animal fat, just to smooth things out. Then wipe it down real good, and rub a drop of flax oil in and bake as usual. Blotching isn’t a problem per say, it just looks strange for a while. I’m more concerned about the lye bath. Where your at right now is much better than where most people started from so just move forward from here – no worries! I was wondering if you cook scrambled eggs in your cast iron? I tried them in my newly seasoned with flax oil pan. I put in about 1/4 c. of butter and 10 scrambled eggs. Unfortunately I think I need to cook other fattier foods in it first as they eggs stuck all over the skillet and when I cleaned it all out, it even removed in small, black flakes all of my seasoning. I re-seasoned and had the same result, a complete removal of the entire finish. Do I just need to be patient and cook other things in it first or is scrambled eggs just going to be difficult thing to cook. I thank you in advance for your time here on this post. Your information is valuable. Thanks for sharing. Hum…. your flax-seed seasoning shouldn’t be sitting on your pan surface, so there should be no chunks to break off ever. I would consider what your seeing to be either ‘extra’ seasoning sitting on top, which you don’t need, or other baked on materials (fats, oils and/or foods). Don’t worry about it, let it flake. In fact scrub it off yourself. I wish I would have known the trouble you were having, I would not have recommended re-seasoning. These flakes need to go. I scrape my pan when turning over eggs, or removing eggs or when scrambling – so when I’m done I really only have a few bits of egg in the pan seem, more on the sides where I cannot scrape easily while cooking. I allow these bits of egg to cool and dry out. Then I take a metal pad and buff them all off, and wipe the pan out. I make sure every bit I can see and those I cannot are scraped off. Then sometimes I rub the pan with a bit of lard or butter to keep it ready for the next use, but not always. It is important to use only good metal tools in your cast iron – no plastic or wood. Cast iron needs ‘polished’ by scrapping over time. This smooths out any surface imperfects and helps prevent sticking in its own way. Constant greasing via cooking to fill in pores – Constant scrapping with utensils to smooth down imperfections = cast iron pan perfection. Some people buy used pans or inherit them and they have a slight bumping surface, which happens over time and use when scrapping hasn’t been done. The best tool is a chefs spatula like those used in restaurants – long, flat with non-bunted edges – perfect for scrapping. As for the seasoning – that is to fill the pores of the iron and polymerize forming a pore seal, and not to sit on top of the pan. Try using more fat during this break-in period. Experiment with the heating of the pan – let it get heat up first, then add your oil and eggs. My pan has definitely gotten better with cooking eggs over time 🙂 so hang in there, your right about the new pan, new seasoning needing broke-in. Thanks so much for this great post! I reseasoned three brand new cast iron pans (after removing the factory finish) using your method. All three looked just like the photo with a slightly glossy look to them. We made fried eggs and it worked just fine with only a few little bits that I scraped out, then I wiped the pan with a paper towel. The problems started when I first tried to scramble eggs. I added plenty of bacon grease and let the pan and oil heat, then added the eggs. It was like baked-on glue. I’ve tried it several times since and it’s absolutely miserable. 🙁 I’m using several tablespoons of butter or lard for just 3 eggs and it’s like I’m putting the eggs in a dry pan. There’s a thick coating of egg no matter how hard I scrape. Once I dish up the cooked eggs, I spend so much time scraping, scrubbing, rinsing with hot water and starting over again that the eggs are cold by the time I’m done. I was under the impression that I had to clean the pan immediately, but I see in the comment above that you let stuck on scrambled eggs cool and dry out first… I’m afraid to try that, but I guess I will have to. I’m just not sure what else to do and I’m afraid to try to cook anything besides fried eggs. Any advice would be very much appreciated. I’m wondering – are you adding water to your beaten egg mix? This may have nothing to do with your issues, but I always add water and whip the eggs together, because it makes lighter scrambled eggs. I’m curious how you make yours…. I’ve never made scrambled eggs without water added so I do not know if this makes a difference or not. Wardeh and I may make an update to this lesson showing how different foods turn out and how to ‘clean’ the pans afterwards. So stay tuned…. With my scrambled eggs, the egg is not ‘stuck on’ like glue as in your case. This is why I wait and flake the cooled egg off. This may not help our situation. Give it a try and post back if it helps or not. It’s been a while so maybe your black spots have stopped – let me know how your pans are working now. Sorry if this has already been discussed – I didn’t see it above. I have two pans with factory pre-seasoning which as noted haven’t held up well with use as the seasoning isn’t durable. I scrubbed them both well and am seasoning them with flax oil as I write this. My question is about the pre-seasoning I couldn’t get off the pans. I scrubbed well and the inside bottoms were partly grey and bare, but there was black pre-seasoning left on other parts of the pan that just wouldn’t come off. I’m now seasoning over the whole pan but am wondering if people think I really need to go fully bare on these pans or whether it’s ok to season with flax over what’s left of the original seasoning. Any experiences along these lines? Thanks. I had a cast iron pan that was pre-seasoned, and it just wasn’t smooth even after removing the seasoning and seasoning it this way. I had my dad take a grinder to it. Voila, silky smooth and ready for a new round of seasoning. My mom says she has him grind hers down every couple of years. I suppose some fine sand paper (the kind for metal work) and a whole lot of elbow grease might accomplish the same thing. Sounds like you’ve done your best to remove that factory seasoning, and that’s all anyone can do. Time and wear will slowly remove the rest. Some (perfectionists:-) sand blast, use metal buffers and even chemicals, but I would just do as you have done. It is going to take time to ‘break in’ new pans regardless of where you start. I would only flax the bare gray areas, as I don’t believe the flax will seal over the other seasoning. Let the other seasoning wear off with use and cleaning. Then when it looks like these areas need sealing because the old stuff has chipped or worn off you can clean and flax the whole pan. One thing that surprised me when using faxseed oil is that the color of the pan turned a bit yellow. I have repeated the process several times and it looks like the pan is getting darker. I actually stripped my Lodge skillet using oven cleaner over night. It pretty much got it down to the bare metal. One tiny spot was left. Now I can see that little spot because the seasoning is a lighter color. I’m guessing that will disappear eventually as the pan darkens in color. I re-seasoned my cast iron pan using your method above about 6 months ago and it has been great, but I recently noticed that the bottom of the pan is starting to look more gray than black. After the seasoning, it was a pretty consistent black all over, but now only the sides and non-cooking surfaces are black, but the bottom is mottled gray/silvery. If I scrub with a stainless steel scrubbie, the black comes off and I reveal more gray. Pretty much every time I wipe the pan with a paper towel, it is dirty black–but I thought that was the seasoning. So my question is: do I scrub off all that black, or is it the seasoning I’m now rubbing off?? You can ‘scrub’ the seasoning+cast iron off – yes. These pans require minimal cleaning at all times. I only suggests scrubbing to remove built up, baked on food, so if there is not material, do not scrub. And if your using lard, and watching your temps on a well seasoned pan the need to scrub should be few. I mostly have to scrub my pan after my daughter uses it. She doesn’t pay attention to the pan, the heat, the oil/lard and messes it up often. A person can always over clean cast iron, it is a balance to keep them greased, free from burnt food/oils and seasoned. Yours sounds like you are scrubbing to much when it isn’t needed and/or when there isn’t enough lubricant to protect the iron, and maybe using to much pressure. Only scrub the stuck on material, not the metal/seasoning just below it. Think of it this way: picture that you can scratch the cast iron like wood, you can’t but picture this when you cleaning it anyway. This will help you to only clean off food particles, and not clean as deep as you have been. I would suggested you use the season-on-the-stove method to re-season that grey bottom, and ease up on the scrubbing. Lean on the greasy/oiling side. No cast iron was ever harmed by leaving lard in it, but to much cleaning is harmful, and will work against your best efforts. The good news is you can reverse what you’ve done, so no worries. Hi, I have two cast iron pans that i have used for a couple years, I seasoned them with Flora Certified Organic Flax oil. I followed all of yours steps, since then, my pans seasonings have basically come off and i want to re-season them. My question is, Is is okay to use my flax oil that has been sitting in my fridge for over a year and a half? The expiry date says Sept 2011. Can i still use it? also your smoke chart says Unrefined flax seed oil 225F, so is that how high i have my oven on for? In step 4 you said between 400F-500F. so which is it and for how long? Do not use the smoke chart for oven seasoning temp or time. It is to let you know at what point oils will start to smoke. Use the temps and times in the article above 🙂 for seasoning your pans. Regarding your oil – If it smells rancid or ‘off’ toss it. However, we all know things can survive their expiration dates. Take a look and see if your oil has become cloudy, discolored or smells – if not then I would use it. Only you can tell if your oil is still okay, so go with your instinct after you examine it. Update: I’ve been playing with stove-top pan seasoning. The main idea being the touch up of already seasoned pans. And I have to say I like my results so far. You may want to consider this instead of a full re-seasoning. -Start with a clean (no stuck on food) but not stripped (grey in color) pan. This assumes the pan has already been seasoned by you, but you feel it could use a touch up. Before you ask – I would not recommend doing this to a store seasoned pan. – Heat it on your stove top on med-high temp. Before it gets to warm, add a bit of fat/oil (rendered fat or flax seed oil) and wipe it all over the inside with a paper towel. Get a new paper towel and wipe as much off as you can. Then turn the heat up to high and allow the fat/oil left behind to smoke off. When the smoking stops turn off the heat, but leave the pan on the stove. After it is cooled a little wipe it off again and put it away. Remember to add fat/oil the next time you use this pan as this type of non-stick requires fat/oil when cooking most things. I just got out a really old cast iron waffle griddle I have. I thought I had gotten rid of it because I couldn’t find it. I was looking in the back of a lower cabinet and was pleasantly surprised to find it. It is sticky and gross on the outside and the inside is dirty. With all those little holes, do you have any idea on the best way to clean it and season it? I would bake it in the hottest oven setting until it stops smoking, at least an hour. Leave it in the oven until it is no longer to hot to manage. Then using soap, hot water and a metal scrubber clean it all real good. Now your ready to re-season – just use the instructions in the article above. Thanks, I will try that!! I have three cast iron pans. Can i leave oil in my pan after cooking. What i do is if i fry anything i leave the oil in the pan untill i get ready to use it again. Then when im ready pour it out , wash it in soapy water and pour oil in the pan and take a paper towel and rub it down, but i have never rub the bottom of it. Should i have?? I only do this when my left over oil is clean, no food or dark bits, as these will help the next thing you cook to stick. But yes, if it is clean leave it. If this is working in a non-stick way for you then great. However, it sounds to me like your building things up a bit and then employing soap to cut the gunk. For my pans to work their best I have to keep the build up from happening in the first place. I use a few different methods of cleaning depending on what situation I have. All of my ‘ways’ are typed out in posts above, but I’ve added one more…. when the food bits left over are not stuck or burnt on the pan I will just use cold water and rinse. Sometimes returning the pan to the stove to then use my scrubber and heat to see and get anything stuck on. This cold water leaves much of my fat coating behind, but moves out all that loose crumble. So I’d say not only do I not use soap, but now I don’t use hot water either. And I absolutely never leave old plant based oils behind or any food residue. Also, if you use a deep layer of fat many times this protects your pan and is clean enough to leave until the next time. Hello – may I ask what kind of a steel kitchen pad are you using? Where did you find it? I use the cheap copper or steal round scrub pads. I see them at all the general purpose stores in my area. With heat and a little oil they really remove the stuck on gunk. Thank you SO MUCH for this post!!! I’ve been struggling with my cast iron pans for a while now. None of the directions I found in the past have been that great. I’m re-seasoning my favorite pan now and I love the flax oil smell it’s giving off. 🙂 I’ll be doing all my other cast iron with this method tomorrow. I have had trouble with black specs on my skillets all of a sudden. I just finished re-seasoning 3 skillets yesterday. I read this post (and the links provided) very carefully, even involving my husband to make sure I was doing it all right. This is the second time I have done this from start to finish, 3rd time I have re-seasoned in attempts to get rid of the specs and I still have them! I am so frustrated:( My 3 year old was so excited for fried eggs this morning and I almost started crying when I saw the specs. Before I did it a second time I stripped those skillets so very very well. Over and over again. Thinking that maybe that is how I failed the first attempt. I miss my skillets!! Please help! Jill, I would use the pan a few times. Perhaps on foods you’re going to feed the chickens. The black specks shouldn’t last long. Jill ~ Using the pans will make things get better. It is true that today’s cast iron isn’t as smooth or well made as it used to be. This newer cast iron can have a bumpy surface, which can cause every aspect of using the pans to be more troublesome until the surface is worn down through time and use…. but I’m not sure if this is part of your problem. Can you provide some more details? How easy is it to remove the specks? Black specs all over the eggs that get worse (more and more black specs) with each round. When I wipe it out with a paper towel it is just dirty looking with black specs. Before I re-seasoned, I had the same issue and noticed that I didn’t have the black specs in scrambled eggs. At least not that I noticed with a pretty thorough check. It is just weird because I used to make eggs in them daily without a problem and then once the problem started, it doesn’t seem like anything is fixing it! A friend suggested something similar to what Wardeh said. I will stay away from eggs for a bit and use the skillets for other things. Thanks so much for your help. I really appreciate this blog! This is why we season at high temps for long enough to burn off all the un-bonded oil. See Step 4 in the directions above and I think it you will understand the process better. I just bought a very nice griswold skillet which was in great shape with a nice black color. I decided to season it with the flaxseed oil method, but after the second pass the skillet came back with black dots all over. It doesn’t feel rough at the touch, the bottom of the pan feels the same but it has spots everywhere. Did I do something wrong? Will it go away? And how can I fix it? I’m so mad for messing up my nice griswold! No worries I’m sure you didn’t mess up the Griswold, they are built to last. Honestly I’m not sure what little thing causes the spots for some, but it is no big deal unless those spots are raised and catch a scrubber as it runs over the surface then it’s burnt on food or spices. Some possibilities are to much oil left on pans when seasoning, oil uneven on the pan, or not enough temperature or time in the oven. However, it could also be something else so don’t worry about it. In time it should all even out with use. It sounds like you only seasoned the pan twice, I’d keep using the pan and add a couple more seasonings and/or maybe stove top seasonings. I know it looks strange and bothers you, I understand, but if you can ignore it for now and use your pan as much as you’d like the cure is in the using. I am sorry you had this experience with your pan. I have a feeling I left a bit too much oil on that pass, but a least it’s still very smooth at the touch. I just found this site, as I’ve been googling “black spots on my cast iron” for some time now. 🙂 I have been followed Sheryl’s method for seasoning my 11″ cast iron pan, and I also ended up with smooth black spots on the inside of my pan starting after the second seasoning. I decided to keep on going to see if it continued. After the 3rd & 4th seasoning, there were more and more black spots. I wonder if eventually these spots will “take over” and create an overall more uniform finish? I’ve been using refined coconut oil; after greasing up the pan I try and wipe out as much oil as possible so I don’t think too much oil is the culprit. I heat the pan in the oven at 500+ degrees F for at LEAST an hour. I’m going to try a few more seasonings to see what happens. I’m not too worried about it, as I figure I can always strip the pan and start over. I basically wanted to respond and say that I’ve been having the same ‘black spot’ result! I just came across this article when searching for information about how to season my new cast iron skillet. When heating the skillet to a temperature that’s higher than the oil’s smoke point, doesn’t the burning oil release carcinogens into the air? I know you mentioned that you shouldn’t cook with a temperature higher than the smoke point, but I’m just curious about the kind of smoky smell going on throughout my apartment right now as my skillet is in the oven. Am I breathing in carcinogenic fumes? The short answer is – any time you smell a strong smell you are breathing something you’d be better off not to. No smoke from burning material is good to breathe, period. Sometimes it’s hard to avoid it though (campfires for example). So do open up your windows, cross breezes are best – windows on opposite sides of a building work well to clear things out fast. Or place a fan in one window blowing out, this will pull air in from the other window. Thanks for posting your question Kristy, if you missed what I said about windows above others may have too…. and I don’t want anyone getting overwhelmed by smoke, especially those with breathing problems. I hope this makes it clear, everyone should avoid breathing smoke from burning materials, even organic/healthy materials. If the iron pan is warm and you pour cold flax seed oil from the fridge into it, won’t that crack it? Or should the oil be at room temperature? Since no one else is chiming in, I will give it a go. The whole rationale with the flax seed oil is that it dries hard. Olive oil never dries at all. (Some artists put a thin coat of olive oil on their palettes to make them easier to clean.) Safflower oil and walnut oil are drying oils. You might try one of those. Be sure the oil does not contain added preservatives or anti-oxidants (including vitamins). Oils from grocery stores often contain such, I am told. Sorry Dana, I didn’t see your post. Dadson’s answer is correct, and many have used oils to ‘season’ other than Flax. I am an oil painter, so I know a bit about drying oils. Flax seed oil (a.k.a. linseed oil) is not the only drying oil, although for most purposes it is the best. Others that are commonly used in oil paints are safflower oil, and (a distant third) walnut oil. I season my iron skillets with linseed oil from the art supply store. OIl that is sold for food might contain anti-oxidants to retard spoilage. Of course oxidation is exactly what we want! I can think of no reason to avoid using old, “expired”, oil. I am going to “super spoil” it in the oven. If it is already somewhat oxidized, how could that hurt? Indeed, for the glossiest, hardest finish to paintings, artists often use partially polymerized oils that have been boiled or left to cook in the sun for a year or two, i.e. stand oil and sun-thickened oil. ~	Jive – this is interesting information. Cast iron cooks off into the food. It will eventually interfere with Calcium absorption. Bett to cook in something else. We all know that burned foods, which can be left behind in cast iron skillets, is very unhealthy to eat. However, the very small bit of ‘iron’ which cast iron cookware can add to foods is supposed to be good as far as my research has shown. In fact, modern cooks not using cast iron cookware is stated as one of the explanations given for low iron in people now days. And iron supplements are controversial at best. Weak bones and lack of calcium was not the problem of the cast-iron generation, but it is of this modern one. Of course this is all very simplified, and there is much more to this discussion than we can go into here. But I appreciate your perspective and post, this is something good to do more research on. Katie Parkin just in case u never got ur pan seasoned. Thank you for this post! I learned a lot and will soon be reseasoning my pans! I tried this method and it did work to a point. I seasoned the pan many times and it still didn’t seem to have that “non stick” shininess. Finally I decided to wipe most of the oil off instead of all of it. This did the trick. I seasoned it two more times with this method and it is now beautiful and shiny and non stick!! Cast iron is all I have ever used. I have every size & shape. I LOVE them. After I season the pan, nothing will stick to it during cooking? Some things will stick. Things with starch like potatoes and gravy, things with sugar like BBQ sauce, etc. and scrambled eggs because of the broken sticky yokes. However many things will not stick. Like pancakes, biscuits and English muffins (cooked without fat), meats and veggies. I love cooking on cast iron. After inheriting some more, I was just going to sell it because it looked painted. A friend of my dad’s says, “No, I think those are the ones he had coated so he could take them camping.” It is coated SO thick including the handles, that I mistook it for paint! What type of coating is it (apparently it’s food safe) and how do I start to get it off? Thanks! Jami, I too read Sheryl Canter’s scientific blog on the seasoning of cast iron (http://sherylcanter.com/wordpress/2010/01/a-science-based-technique-for-seasoning-cast-iron/) and I have seasoned all of my 3 generation old cast iron pans and kettles in this way. This method works well. I do wash my pans with hot soapy water, dry on the stove top for a few minutes and apply a thin layer of a cooking oil before hanging them back on the wall. To strip the old seasoning from cast iron one of Sheryl recommendations is to place it in your self-cleaning oven and running the cycle. THIS WORKS VERY WELL and is the easiest way to strip cast iron, and it uses no chemicals. On some of my pans there were places where the old seasoning remained and would not come out even when dry scrubbed with bronze wool, so I just left it there and it was just fine, (all seasoning should be so permanent!) Your pans will want to rust once they are stripped and wiped out with paper towels and micro-fiber cloth so proceed with the oiling immediately. I’ve used this method to season cast iron in the past and it works very well. Yesterday I got my first piece of enameled cast iron and was seasoning the inside. It didn’t even occur to me to keep the oil off the enamel and now my beautiful new skillet has an ugly splotched exterior! How can I get the baked-on flax oil off the enamel without damaging it?? I just wanted note that this doesn’t work well with carbon steel woks. They get so hot so quick and the metal is so smooth the seasoning will just brush off when you rinse it. It’s okay to add a layer after using traditional wok methods to even out the color of the wok, but it will be a fickle and will only really be for looks on the outside. I’ve had good results with my ci though as long as I’m not using it to sear food right away (ie only bacon and eggs at a lower temp for the first 10 or so uses) it can be a really hard and slick seasoning if you know it’s limitations. I think the flax just burns off too easily if you cook stuff real hot though. Fyi I used to like to cook with refined coconut oil but my new favorite is rice bran oil. I went to view it but it looks like I have to pay 10.00 to do so? Am I understanding correctly? I heat clean pan in oven (like 325 degrees….) turn oven off. Oil pan and put back in oven until cool….I do it every time I use mine & they are no stick for sure! I have a used pan that needs reseasoning so I’ll be trying this method. I’ve always got someone telling me I can’t use cast iron on my glass top stove. Nice to see I’m not the only one who does! We cook in our cast iron skillets all the time. They’re the best! It’s such a healthy way to cook, too. I used this method for a new skillet I received for Christmas. It is by far the best method of seasoning I have ever tried!! Thanks!! Jen Rollins, how did yours turn out? I have recently read some things online that suggest that cooking in cast-iron can give you too much iron. Anyone else heard that? Lysa Twardosz, good but I’d like to season a couple more times since I completely stripped them down. This picture is after 2 rounds of seasoning. How often should you re season them? Do you have to do all 6 steps every time? Wow, this is the most comprehensive guide to seasoning cast iron I have ever seen. I got a combo olive/grapeseed oil and it’s not worked as well as bacon grease. but I also need to look at the fact it’s gonna take 4-5 times to get it seasoned right. Great post! I did two skillets this week. One was particularly nasty after a failed attempt to reseason it with lard. My husband stripped it to bare metal. Both pans came out great. I finished my seasoning yesterday. I followed the instructions to a “t”. My CI skillet looks BEAUTIFUL!…so beautiful, I almost don’t want to use it. 🙂 Thank you for the amazing post. Excellent write-up. It should be noted, though, that flaxseed oil smoke is some really nasty stuff. I mean, all smoke is bad to inhale, but inhaling flaxseed oil smoke has been directly linked to increased lung cancer, enlarged spleen–as well more immediate physical unpleasantries like headache and cough. Proper ventilation is a must. This is the best tutorial on seasoning cast iron pans that I’ve seen yet! I’m going to buy myself some flaxseed oil and re-season my workhorse pans this week! Thanks soooo much for this excellent article! I actually just seasoned mine this morning… But I did not read this ti later. I will try again. I have a question: what exactly do you use to scrape off food that sticks to the pan? Thanks again! Oh my goodness I want to thank you so very much! I am ashamed to say how long I have had my iron skillets. I love the idea of using them but hated to because they always stuck and were hard to clean. I would season them like everyone told me but it still would stick, they said it would get better with use but it never did. I didn’t know I needed to season it more than once! I have started seasoning like you have said, but I’m trying it with lard. It looks way so much better than it ever has! If it still does stick I will start over and use the flax but I had already bought the lard to try so using that first. What would you suggest cooking in it for the first time after seasoning? Again THANK YOU!!!! I am excited to give this a try. My pans have sat for almost three years with me not knowing what to do with them. In what I read, there was a mention of seasoning the outside and handle. But I am not sure if you are supposed to do that or not. It wasn’t clear to me in the post. Do you season the inside of the pan, the inside sides, and the outside, bottom and handles? It depends, are you stripping your entire pan inside and out – then yes season it all. But if the outside is okay, or has some seasoning on it already, then no you don’t need to. I used this technique on two fry pans, my griddle, dutch oven and the grill grate from a Weber Genisis. I can now fry eggs and the fry pans are slicker than teflon. I have a cast iron skillet with a rubber(ish) coated handle. How do you season something like that in the oven? I don’t believe you can. But that would be a good question for the manufacture. I bet they’ll tell you it’s per-seasoned and will last the life of the pan. Maybe someone will know how to get it off your handle. I’m confused. I believe you say to use flax oil to season the pan. But then later you say not to cook with it because the smoking temperature is toxic to food (my paraphrase/misunderstanding). How can both of these be right? Am I missing something? Thank you. It can be confusing I know. In the instructions in my article I explain that the high-temp long-time smokes off the flax-seed oil and changes it chemically into a polymer coating. All smoking should be long finished before the seasoning is over. This is also why you only want a thin coat of the oil, you even wipe it off before starting. This leaves nothing sitting on top to chip off into your food as a carcinogen. We are using the oil to create a finish on the iron, not to grease up the pan in any way. Flax see oil should never be use as a cooking oil with heating. It will make more since I think if you go back a re-read the article now. I suggest using an outdoor BBQ Grill to season cast iron items. Gas is preferable to charcoal for temperature regulation. The smoke and smell won’t cause issues like they might indoors. Check to make sure the cast iron items fit in the BBQ before you heat things up (may need to remove upper racks), and use an oven thermometer to check the temperature. “flaxseed oil is the only drying oil that’s edible.” What about things like walnut and hemp oil? They are both listed as drying oils and they are edible. They do have higher smoke points but I don’t see why this wouldn’t work with one of those oils. We actually use hemp oil to seal our butcher block counter tops. It is great! Am I supposed to be seasoning the entire pan, like the outside, bottom, handle, etc.? I have always seasoned the inside, but the bottom appears rusty. Should I have been seasoning the entire thing? When I re-seasoned a Lodge pan I had bought new from a store I only cleaned and re-seasoned the inside and top edge. When I re-seasoned old pans I bought from ebay I did the entire pan as they were light grey and had uneven surfaces from old gunk. So the answer to your question is – what state is the cast iron starting from . . . ? I do not eat cooked items from the bottom or outside of my pans, so I’m not so concerned about ‘factory seasoning’ remaining in these areas. 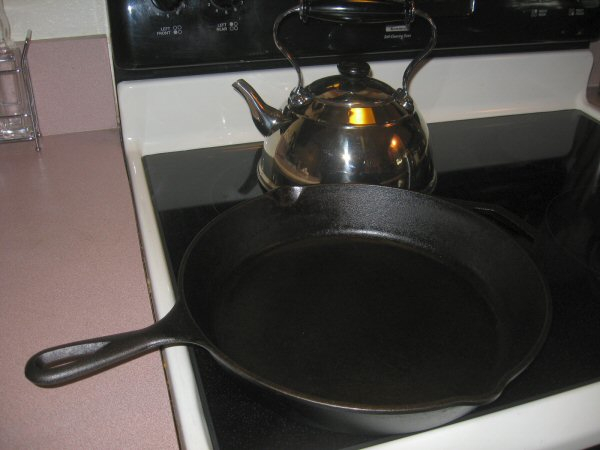 Should I have a pan with rust on the outside/bottom I would clean all the rust areas real good and re-season all areas that currently do not have the proper protection seasoning gives. I hope this helps you decide how much to season for your cast iron cookware. Would the seasoning part also work with stone ware? I have recently bought some second hand, and would like to get it seasoned sooner rather than waiting several years for it to happen naturally like our pizza stone has done. Hi..! I’m about to season my cast iron skillet. I have a bottle of Trader Joe’s Organic Flax Oil with Lignans. The ingredients are: cold pressed unrefined organic flaxseed oil, organic milled flaxseed, organic rosemary extract, mixed tocopherols (non-hexane extracted natural vitamin E) to maintain freshness. That was a mouthful..!! Anyway, will this work? Do I need just plain flaxseed oil? Any suggestions? Thank you. Where do you find a steel pad that has no soap? Also, I want to try this; I have original Wagner pans from my Grandma — they are in pretty good shape; one is so old that it is no longer completely flat — must have gotten too hot? I find them every where – but I like the ones from the dollar store best. The ones from general stores or grocery stores are to thick and loosely made so my fingers go right through them – Arrrgggg. I find them in the kitchen sponges section of every store that sells kitchen scrubbers. I get a pack of 3 for a $1 They look like copper, but I don’t see how they could be for that price. I have numerous cast iron pans. Doing this your way would cost me a mint in propane (my cooking fuel). I have 3 pans that I use regularly, and only 1 really needs reseasoned. I’m thinking of having the worst ones sand blasted, then reseason. I’d like to set up an outdoor oven heated with wood. That would prove far more economical for me, If I can get such oven up to that temperature for an hour. I have lots of paradise trees I’ve cut down that I could burn. (too bad I don’t have the root ball we dug out a couple years ago…that thing burned for a week!) All for future project. Thanks for the post tho. Oh boy it sure would…..
How about using a friends oven 🙂 you bring the snacks. Or using a open fire pit – I don’t have experience with this, but I’ve heard that’s how it was done in the olden days. Do post back if you try it with wood, that would be great to hear about. vac to clean up the mess. Then I followed the directions for seasoning cast iron. Works like a charm. Fries much better than no stick pans. This method even works for cast iron grill grates. Had to wait for my wife to leave for the weekend, because it does stink up the house. I tried to re-season my two cast iron skillets that are about 100 years old. (They have been passed down to me.) I used Crisco. After reading this blog, I am pretty sure that may have been a mistake. Now they are sticky. How do I undo what I have done? They were in pretty good condition. You can tell if you’ve removed the old seasoning by the color when the pan is dried – light grey color and dullness (a dry rough look) of the pan. Usually it’s only a factory seasoning that requires the strongest methods to remove. So see how a little bit of soaking and scrubbing works for your pan. Let me know if you have questions . . . .
For cleaning I have found a wonderful technique. I use salt and coconut oil. I gently scrub in circles until all the cooked on bits lift off. Rinse with warm water, briefly heat over medium to dry and wipe very lightly with coconut oil (or Crisco/lard) while warm. Buff off excess with paper towel. Done. I tried the flax oil method a few years ago but did not have good results. Probably my fault. I did another method and it worked out. Thanks Amy, that sounds like a great way to remove those stuck on bits. I have been wanting to switch over to better cookware for a while now, but don’t really know much about cooking with cast iron. Do you have recommendations of articles or websites? if i am just buying one or two pieces to start, which are the most versatile, what would your recommend? What advice can you give a cast iron newbie? Well, I’m sure the advise would be a little different depending on who you ask 🙂 But I’d say to start with a large 12″ skillet to practice getting your feet wet. A large skillet gives you many options for preparing different foods. With such a large skillet you’ll need to allow it to heat up a little before your up to cooking temp. Also, you will notice that the skillet is a little bit cooler at the handle side. Soon you will make adjustments and be just as comfortable cooking on your cast iron as on your old pans. As for best brands, it’s been to many years since I’ve purchased new cast iron – maybe someone else will have a recommendation. I’ll I find in stores where I live is Lodge now days, and I would prefer to avoid that brand. Do some research on where cast iron pans are produced and you should find some good information on the differences. Do spend some time getting familiar with your cooking oils/fats. Cooking with cast iron is easy once you learn the little nuances, and using the right oils/fats is part of it. Do cook with oil combinations, butter, coconut, bacon, etc. Do print out a smoke chart to check up on a oil before trying it, and adjust your temps accordingly. I can smell when my daughter has the heat up to high for an oil from our living-room, and when I go have a look it isn’t even smoking yet but it’s about to. She gets impatient, wanting the cooking to get going. So just realizing you need to be aware of your temperatures, and using the proper oil/fats is half the learning curve. I remember years ago relatives saying how different cooking on electric stove was vs gas – “watch out” they would say, it takes a bit longer to get going but then it will burn if your not careful. I haven’t cooked on gas since I was a child and can’t even picture the difference any more, but I remember all the fuss when we moved from one state to another, from gas to electric stoves. Getting the feel for cooking on cast iron is like that – it starts slow and so you may be tempted to increase the heat, but be careful. Just knowing this will help you to be on the look out for this subtle difference. Personally, I now start with a bit higher temp and then turn it down a little when I start cooking, but it took me time to figure that out too – Oh the life of the impatient personality! Cooking on cast iron is wonderful, and once you become used to the change you won’t want to cook on lighter cookware any more. Cleaning old pan is a nightmare. I inherited a several old pans and I had to clean them. I scrubbed them 3 hours…. It was painful for my patience. Unfortunately I found your article too late. Thank you for sharing it. Best regards! I definitely need some advice and understanding. I stripped and cleaned a cast iron pan thoroughly and seasoned it 27 separate times with flax seed oil. I baked it at 475 degrees for 75 minutes each time, according to another website. I started in a cold oven and let the pan cool in the oven before removing, as stated in the above post. Each coat was thin ( no dripping and barely a satin sheen ). When I washed the pan ( using Dawn and a sponge ) before cooking in it , the seasoning came off to the the base metal. The flax seed oil I used was Jarrow pure organic flax seed oil. I have scrubbed all the seasoning off and will start again. Any advice? Maybe I’m misunderstanding your post. Dawn would be a good way to help remove, strip the seasoning down to metal. But soaps should not be used to clean a seasoned pan, and a pan never used should not be in need of cleaning….. so I’m confused. Can you shine some light on why your washing with Dawn 🙂 and give a little more information. I’d love to make things easier on you. Originally after the seasoning process the pan was sitting on the counter next to a cracked tomato (maybe an hour or so). Some of the juice from the tomato leaked out onto the counter and when I picked the pan up I noticed on the bottom where the tomato juice touched, was a spot that was completely cleaned of all seasoning. Someone suggested washing with the dish detergent to neutralize the acid of the tomato. It was down hill from there. On another pan seasoned with the same flax seed oil, I cooked a salmon burger and then washed it with sea salt and water. The seasoning came off this pan as well, just not as much as with the Dawn. That is why I am wondering if it is the flax seed oil. It is organic but does not say cold pressed. It says fresh pressed. Could this be it? I am trying again using Crisco at 475 degrees for 45 minutes and may try Daryle’s method below if this doesn’t work. However if flax seed oil is better, would like to maybe try with another brand. Suggestions? These are old Griswold pans. Because the tomato issue was only on the outside-bottom I would have wiped that spot clean with a damp cloth, rubbed on a drop of oil and left it without ‘proper’ seasoning. Over time and use it would be just fine. That tomato acid would eat off your finish and maybe even eat into your iron a bit, but it cleans off easily. If the tomato juice was put inside the pan – I still wouldn’t use soap. Just a good rinse out and dry by wiping. Then re-season. What I used for cleaning is – warmed pan + oil, warm pan, oil + salt or warm pan and metal scrubber as needed and wipe with paper towel. I never use soap, and very seldom use any water. I mostly use my cast iron to cook meat 90% of the time, and it’s the only frying pan in my kitchen. When I do cook pancakes or biscuits I use a dry (no oil, seasoning only) cast iron pan. I would cook chili and other soupy-think dishes in a stock pot (enameled cast iron). And I find items seasoned with sugary sauces (BBQ etc.) do well in a oven on parchment paper. Sugar sauces do nothing but stick *grin* so stir-fry sauce gets added after meat/veg is cooked and removed into a bowl, then poured over rice. The order of things is the key. Knowing what tool to use for what, and when really helps with damage control, and to prevent extra work in the kitchen. 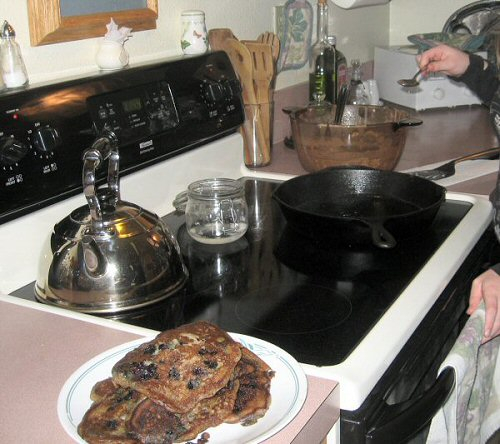 With the years that non-stick was king our moms got used to throwing everything into one pan, and this is how we learned to cook. Now that we know better about toxic non-stick we have to rethink the steps of cooking a dish a bit, but it’s all good as we look toward a healthier future. I’m still using a couple of pans I bought and seasoned way back then. Nothing sticks. We all know that various oils and greases can and will produce a seasoning on cast iron, however the questions in my mind become is that seasoning toxic, and/or chipping off into our foods. So for health reasons I would never used mineral oil (petroleum based product) or Crisco (partially hydrogenated vegetable oil). I’m not comfortable with achieving a seasoning at any cost, but that’s just me. This topic of seasoning cast iron is subjective at best. One person can try using bacon grease and do to variations in the steps they take it doesn’t turn out. Then they can try canola oil and this time it works. I would not blame the oils, or say one is bad the other does the trick. The oil one used when everything ‘worked’ is the oil they swear by. Mineral oil, a byproduct of crude-oil processing. It is commonly used as a lubricant in industrial applications, such as oiling heavy machinery. Mineral oil contains no nutritional value. Mineral oil blocks the body’s absorption of certain nutrients, however, and can lead to vitamin deficiencies if used for longer than a week. I have a 2 sided grill pan….can I season both sides at the same time? Yes, just wipe the item real well and you shouldn’t have any drips. You can also put a tray under your item just in case. Flax seed oil is not the only edible drying oil. If you are interested, do a search for others. I use walnut oil. My question is, will any of this flax seed oil leach into food while cooking? Won’t we be consuming oil that is now turned into free radicals? From what I have read – as long as you have a seasoned pan that is where the ‘changed’ flax oil is remaining. If it were chipping off, as Teflon does into your food, your seasoning would be noticeably disappearing after time and use. I still have the same seasoning on my skillet as seen on the pan in this tutorial. Years of use and scrubbing and it is showing no signs of ware…. Having said all of that, I would add that if any were coming off (1) I would think it would be during the good cleanings I give my pan and/or (2) so small an amount as to be non measurable. Even with just a good wiping after a use the PT is very black showing that even though the Flax seal remains the cooking oil, seasonings and/or foods do blacken and sit on top of the seasoning. Using cast iron is not the most toxic of cookware, however it is not the least toxic either. I would be more concerned about burning food, oil, etc. and consuming that, or not cleaning the pan with food bits in it and consuming these burnt bits from previous meal cooking’s. Glass cookware is my #1 choice for non-toxic, but it has it’s drawbacks as well 🙂 Cast iron is my #2 choice as far as clean cooking goes, and #1 for certain cooking processes that can’t be duplicated in glass. I end up using my cast iron for all frying and fast warming, and my glass for all other cooking methods. This is just my take on it after doing my own due diligence, Wardeh my have additional information to add to mine. Yours is a very good question Shey, and I hope I’ve answered it to your satisfaction. I have only used this pan on two different glass-top cook stoves and in their ovens. I found a nice glass lid with metal handle for it at the Good Will. It’s an amazing tool in my kitchen. I’m in the process of seasoning my skillet, but does it need to actually cool completely before doing another coating of the oil? It’s been sitting in the oven now for almost two hours, and it is still super hot. When the pan is warm/hot during the process the seasoning can be sticky and has not finished ‘drying’ or harding. Your pan’s seasoning is harding off now. I just finished the sixth coat on my pan… it took about two weeks to complete as I never had the time to do more than one coat at a time. I added a very thin layer of ghee in the pan and let it heat up for about three minutes and then cooked a fried egg that stuck pretty badly. What could I have done wrong? I’m so disappointed. Thanks! Oh I’m so sorry to hear that Michelle…. Not being there to watch your process I can only guess – I believe your seasoning is probably a little gummy. Maybe you did not wipe the oil off completely before you baked it in the oven, or maybe the layers did not fully harden before another layer was added. Just 1. use a metal scrubber (no soap) 2. Heat your pan on the stove top to very warm, but not to hot to work with, then 3. Give it a fast, surface, scrub (not hard, just fast, think friction), add oil if needed. 4. wipe it with paper towels in between surface scrub-jobs. When the towels are not pulling out dirty/black, then you are done. Turn off the heat. If you feel any areas are still gunky, because the scrubber slows down when moving over that area, add a bit of oil to help the scrubber glide over the whole plan. Oil helps clean off old oil. Continue wiping…. This will knock off surface, sticky, gunk. Repeat whenever you feel your pan is sticky. This is another reason why cleaning the pan while still hot after using it is so important. Letting oil and food bits cool in the pan will leave you with a sticky pan. Use the heat of the pan and new oil to clean off old oil and stuck on foods 🙂 as described above. Thank you so much for the detailed response. I did exactly as you said and then made another fried egg, and while it was better, it did still stick a bit in places and definitely was not exactly like a non-stick pan. Cheese is another big one that seems to be sticking. Any other ideas? Hi Michelle, thanks for your feedback! Do try only animal based oils when cooking eggs (protein to protein) to start with. You may have done this already, but I wanted to mention it just in case 🙂 Heat the pan before adding the oil, wait a few seconds and add the eggs, turn the heat way down when you add the eggs. Just like meat allow the eggs to set/cook before moving them or the pan. In cast iron cooking food goes through stages, allow the food to cook on the bottom and ‘release’ before you touch or move it. I have read of some people adding salt to the warm oil just before the eggs are put in to help them not to stick. I have never tried this myself. I would add cheese after the eggs are removed from the pan. Other than this, the only other thing to do is to keep working with your pan – until things get better with your experience, and the pan’s use/seasoning develops…..it will happen, as long as you stick with it – I promise. I should mention, for everyone reading this blog, that the perfectly seasoned cast iron pan will not behave like those slick, non-stick pans available on the market. Also, that eggs and cheese can be a challenge in cast iron. Some oils are stickier than others, some foods are too. So where does that leave us with cast iron…. it is a very healthy cooking choice – better than most, but a challenge when compared to chemical-non-stick coatings, including ceramic coatings. We have been sold convenience over-all-else since the 1950’s. These coatings are toxic. When I cook scrambled eggs in my cast iron about 10% ish will be left on the pan, but if tackled right away, the clean up is straight forward, the egg comes right off. So I always clean my CI pan right after removing the food, with a metal scrubber no elbow-grease needed, because the pan is still very warm, hot even. This is a pan we cannot really leave to soak while we move on to other things, I’m sorry to say. Remember to not shock your cast iron, via cold water or a cold tile surface. Cast Iron really is a great choice. Olive Oil and Coconut oil work very very well in these pans. Cast Iron retains so much heat, you preheat the pan put the eggs in, cover it and remove it from the burner or completely turn off the burner. The eggs will cook in 5 minutes just sitting there. You are fixing coffee and oatmeal and packing lunches so it’s time you don’t even know has gone by. You can put a few strips of cheese on top to melt after it’s removed from the burner. Cast iron not really good with cheese. Use a stainless steel pan for grilled cheese (for example). Also not good for frying hamburger (s) etc. Your cast iron pan is GREAT for baking something (cornbread) in the oven. Its like Jamie said, it really comes down to making a conscience choice you will have to give up some convenience we have been sold over the years for a more healthy life style not filled with chemicals and toxins. Ooops, I see in my haste I wasn’t clear 😀 the heat outside is getting to me…. 2. Add your oil and give it a couple of seconds to warm. 3. Add your eggs – and turn the heat way down, or like Rebecca said turn it off great idea. Either way you are cooking with the stored heat in the pan. 4. wait until the eggs have cooked on the bottom and released from the pan. It takes a while to learn the timing just right on this step, but it is so worth it. It could just be what I have on hand, but I find my coconut oil can be a bit more sticky when cooking items like eggs. So I go with butter. See what healthy oil works best in your case. Thank you so much for the quick responses ladies. I’ve heard that a cast iron pan can be exactly like a non-stick pan so that’s what I was hoping for. After inheriting a few cast iron pans years ago, I’ve finally decided it was time to re-season the one I didn’t use (because it was flaking and looked gross). I ditched the teflon years ago, but never knew if I was doing something wrong the way I used my cast iron, so these suggestions are helpful. Thanks so much!! I’m excited about trying this method! My skillet has been working well and it’s nonstick when I fry eggs. I’ve been noticing tiny black flakes in my food and I see the “marks” that are left behind from where the black has chipped off so I think it’s time to re-season. I did not use flax seed oil when I originally seasoned the pan. 1. Since my pan seems to be already well seasoned and I have no sticking issues, how much of the current seasoning should I remove? 2. Can I do actual cooking between seasoning layers? What if I only have time to season twice and I need to cook something using my skillet? Would it be okay to fry an egg or cook some hash browns and pancakes and then continue with the layers of flax seed oil? It sounds like your current “seasoning’ might be from the manufacturer – is this correct? Or did you do it 🙂 If from the store I would say remove it all, the sooner the better. If you did it using a good oil/lard I wouldn’t be so concerned with a total redo. If the outside/bottom is still good, you can simply give it a good scrub on the inside bottom & bend, I would use a metal pad, and then do a cooking-area only seasoning. Yes, you can cook in between seasoning rounds – watch out for high temps, and heavy oils as these can make things become a bit gummy when you do not have a good seasoning layer… You don’t want to add seasoning only to clean it off again just to remove the gummy/tackiness. My daughter is very hard on my pan’s seasoning, doing all the wrong things 😀 when she gets distracted. So I have been experimenting with stove top – inside bottom seasoning just to restore the non-sickness in between her mishaps and it’s working out super. So a total redo isn’t always necessary it just depends. Clean your pan while warm, wiping it dry of excess oils/fat and cooked foods. When cooking bring your dry pan up to temp, then add your oil/fat if using it, and food. Allow searing meats to release before moving or flipping them. All of this will help prolong your seasoning. Well, I did it! I managed to put 9 coats of flax seed oil on my 2 Lodge skillets (I have an 8 inch and a 10 inch). I did each coat back to back with no cooking in between coats. They look beautiful and I’ve cooked with them several times now. They’re practically nonstick BUT each time I’m done cooking, I give them a good scrub with hot water and a plastic brush then I heat them on the stove again before adding a bit of avocado oil. I wipe them down with a white towel and each time the white towel picks up a bunch of black residue. Have you experienced this as well? What is the residue? Is it safe and okay to ingest? Will it go away over time? When I initially bought the skillets, I completely removed the factory seasoning by sanding it off with some heavy grit sandpaper. Then I seasoned them about 4 times in the oven with avocado oil. After about 6 months, chunks of black flakes started to come off when I used them, so that’s when I decided to try the flax seed oil. This time around I used medium grit sand paper to get most of the flaky seasoning off. Some of my previous seasoning remained on the pans. When they looked smooth, I washed the pans with soapy water. There was a similar type of black residue on the them then, but I kept washing and rinsing until the residue was a very faint gray. I don’t remember seeing such a dark residue when I first seasoned the skillets with avocado oil. I’m hoping it’s only temporary and is totally safe to cook with and ingest. Please let me know what your thoughts are. I appreciate all your help and feedback! So good to hear about your seasoning journey. I’m sure that will help others with their journeys too. Yes, I experience this all the time, it’s left over residue (very small bits of oil, food and iron), and like you I keep my pans clean to remove surface bits in between uses. No, it won’t go away, but the iron is neither harmful or helpful to us. You are not getting significant amounts of the ‘blackened bits’ when cooking with cast iron, so no worries as long as you remove old surface foods-oils by wiping. No need to over clean either, just match your effort to the job. It’s BBQ-ing you want to watch. The grill coated with blackened food/fat bits – how often do we clean our grills back to the metal and coat with new oil ?……..Some people just love that burnt, crunchy bit on ribs and wings – but some studies show that it’s not good to consume blackened-food/char in the larger amounts. However, we all get some, and it is not a health issue in small amounts. Remember roasting marshmallows – oh boy! Is there any scientific reason non gmo or organic is required? Flaxseed is produced in mid asian bread basket which is prone to child labor violations. This includes India, Russia, Pakistan, and Uzbekistan. Additionally, it is produced in Africa which is also prone to child labor violations. Low yield crops also lead to more co2 emissions due to increased use of machinery till and harvest these smaller yields spread out over larger fields. No, and if you feel better using a different oil go ahead…. Flax seed oil works the best at creating a slick hard surface. However, people have been using bacon grease and other animal fats for a very long time.